Yep, there was a lot of spin in the lead up to COP21 at the UN’s Climate Change Conference in Paris. So we decided to create The 50 Days of Spin. 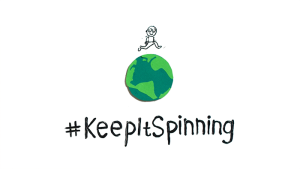 Until the first day of COP21, we posted a climate story every day on Twitter, Instagram, Facebook and Google Plus, together with a <15-second spinning video/gif and the hashtag #KeepItSpinning. You can watch all 50 spins in the storify below. We also curated a special COP21 soonfeed, so anyone could join key moments online from the Paris talks in glorious, spin-free realtime. What was the best live content we discovered at COP21? It wasn’t the official live streams, the live blogs by journalists or live tweets by zealous delegates. It was this Google Doc by two students from New Zealand. Their realtime transcript of the talks was peppered with enough snark and gifs to make the most mundane of proceedings kind of compelling. It was also a handy resource for anyone wanting to follow the closed sessions that weren’t live streamed. So you needn’t be high-tech (or high-brow) to pull an online crowd around live moments at an international conference… just add the happening to a soonfeed so anyone can discover and get an alert as it starts. Richard Medic is Chief of Happenings at happeningo digital agency and Soonfeed media.